E-BOOST is a unique and power-packed, immune-boosting mix of essential vitamins, minerals, and nutrients designed to help keep you energized, mentally focused, and on the top of your game. 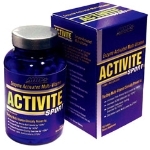 Ideal for people on-the-go, those that lead hectic and stressful lives, and anyone with difficulties getting daily quantities of essential nutrients from food alone. Available in both effervescent powder and tablet forms, E-BOOST quickly releases nutrients throughout your system through an easy-to-absorb effervescent delivery system that lets the nutrients start to work immediately. E-BOOST is being hailed as a "modern miracle" for the uniquely, uplifting effect this powerful formulation provides. For about a dollar a dose, your body and mind get a "boost" that nothing else can provide. 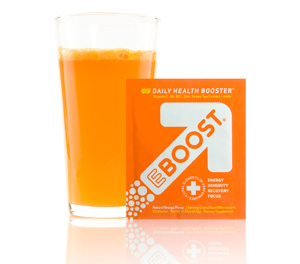 E-BOOST packs immunity-boosting Vitamin C, a large dose of B-Vitamins to boost performance, and 5-HTP for mental acuity, into a refreshing, orange-flavored beverage that is gentle on your stomach. Just add water. Designed specifically to boost immunity, relieve fatigue and wake up your mind, E-BOOST provides an overall wellness "boost" to help you get the most out of your day. Yes, it's good for hangovers, too. E-BOOST was developed by New York City restaurateur John McDonald and marketing maverick Josh Taekman when they both became frustrated by the sugary, overly-caffeinated and artificial "energy" products on the market. John and Josh spent two years developing E-BOOST, a wonder product that would boost immunity, improve general performance and enhance mental acuity. Suggested Use: One packet or tablet in 8-12 ounces of water our beverage of choice! Chronic fatigue syndrome (CFS) is disabling fatigue lasting more than six months that reduces activity by more than half. CFS is a poorly understood disease involving many body systems.